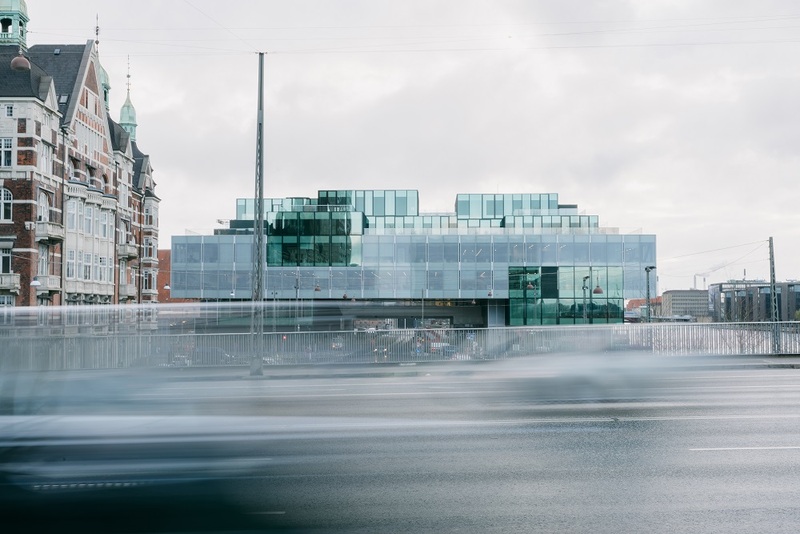 The recently completed BLOX in Copenhagen is an intertwined and complex manifestation of a building that holds a large portfolio of actors – ranging from software engineers to bodybuilders. The programming of the spaces within the stacked design of the building suggests overlaps of territorial ownership and accessibility that challenge how the building can be and is used. BLOX had a rough start. A few days before the building was even opened to the public, the press and architecture critics, both at home and abroad, had already cast their verdict. ‘Monstrous’, an ‘urban jumble’, ‘Copenhagen’s ugliest building’ – to mention but a few of the headlines. Keeping in mind that these reviews were written before the building had opened its physical doors and been taken into daily use, it can be questioned whether BLOX even had a chance to prove itself worthy of occupying a desirable and central location on the Copenhagen harbour front. Yes, the building is different. No, it is not particularly accessible. Neither is it very Danish (what does that even mean?). But what is it that the building can do? And how is it used now, a few months after the red carpet was rolled out and the ribbon was cut? First of all, let’s get something straight: BLOX is not a public building. 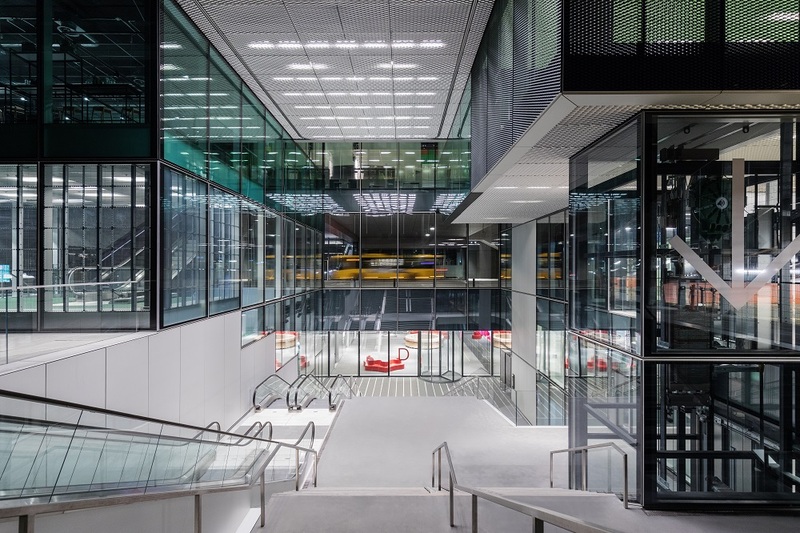 Designed by renowned Dutch architecture firm OMA (Office for Metropolitan Architecture), with partner Ellen van Loon as lead architect, the building holds the ambition of reaching out to the rest of the city, tapping into it and bringing the public in as advertised prior to its opening. As stated by Jesper Nygård, CEO of the private and philanthropic association Realdania (established in 2000 to support the built environment in Denmark), who funded the building: ‘BLOX is an offer to all of Denmark and to Copenhagen.’ However, considering the practicality of the 110 DKK (about € 15,-) entrance fee that the Danish Architecture Center (DAC) charges the average guest to enter beyond the building’s reception, that intention is relative. BLOX is not for everyone. The borders of the public realm run along the periphery of the building and through an underground passageway that for various reasons seems symbolic, since it is easier to just cross the road at ground level. Although the intention is to open up the building and offer the public an experience, the descent from the exterior ground floor does not feel natural – unless your aim is to visit the interior of the building with the purchased ticket. Beyond existing as a (semi)public route under the road above, the passageway is also where both the main reception of the building is located and the entrance to the DAC. One might say they are the key holders to unlocking the spaces of the building; the DAC occupies the core of BLOX and its main exhibition space is in the exact centre of the 11-storey building. The central location is noticeable from all of the above floors, and the highly visible presence of the DAC is emphasized by the presence of a shop, conference facilities and a café. Surrounding the architectural exhibition spaces is BLOXHUB, which brings together organizations, companies and researchers working on urban innovation. Scattered across two of the floors, the members of BLOXHUB occupy the spaces in diverse ways and are more or less spatially enclosed. Together with the DAC they are the main occupants of the building, but their coexistence appears to be without much interaction and more of a constant territorial negotiation. 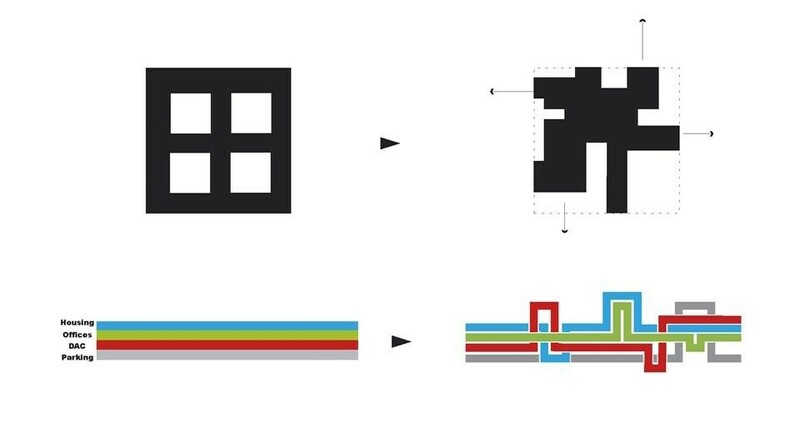 This comes through when navigating the floors of both parties; there are continuous visual connections through windows, but the spaces between them are firmly divided by walls and doors. On the second floor, for instance, the circular circulation of the entire floor is cut off by solid walls – out of sync with the spatial logic of the building, since all of the other floors are open. The territorial compromise between the DAC and BLOXHUB even extends out to the exterior spaces on the shared terrace, where the arrangement of the plant pots indicates who can sit where. Considering the fact that both the interior and exterior spaces are generous, this is an enigma. Although the building’s programme is interesting in terms of how it plays on the stacking of functions and actors, this might have been taken slightly too far with some of the overlaps. Especially the prominent and large location of the fitness dk (fitness centre) overlooking the harbour front, which also spans parts of the two floors, can appear intimidating at first. Primarily because the DAC’s guests will most likely experience at least a few bodybuilders doing squats and shoulder presses on their way to the exhibition spaces. 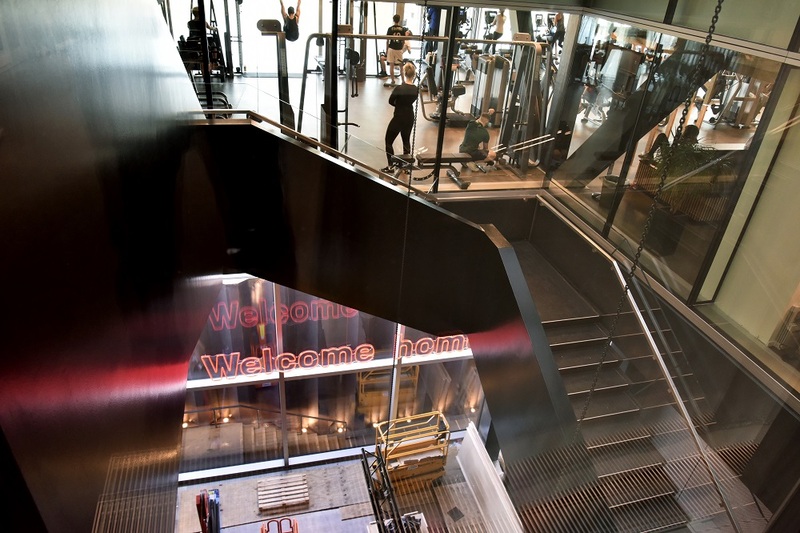 However, guests who are familiar with OMA may experience this differently – the interaction between the fitness centre and the rest of the building seems to be a direct translation of the Downtown Athletic Club from OMA’s founder Rem Koolhaas’s 1978 book Delirious New York (depicting boxers eating oysters while boxing). The mixed-use intention of BLOX is clear with its many visual transitions, and although there are no oysters at BLOX, the way the building’s actors overlap seems to be a strong reference to the early work of OMA. Hopefully the intertwined nature of the building will foster new collaborations between the different actors and begin to break down the internal borders, both metaphysically and spatially. Projecting out into the future, BLOX should be at the forefront of fostering progressive and innovative collaborations – and not just housing them under one roof. 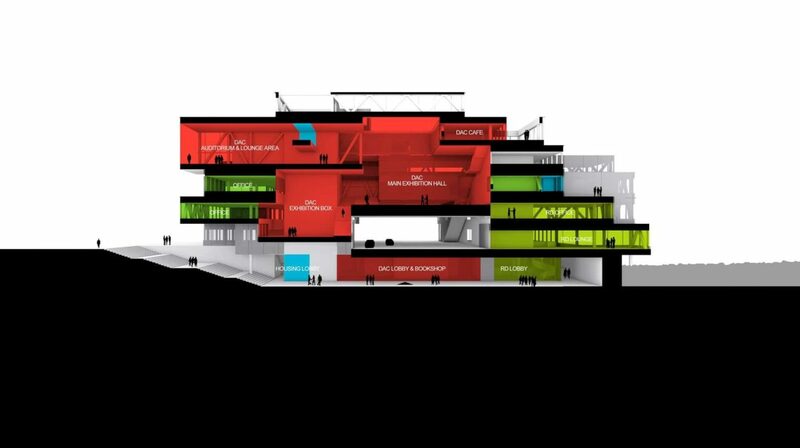 Of course the building can only facilitate this to a certain extent and it is up to the occupants, especially the DAC and BLOXHUB, to be conscious of the unique potential of being gathered in one building. 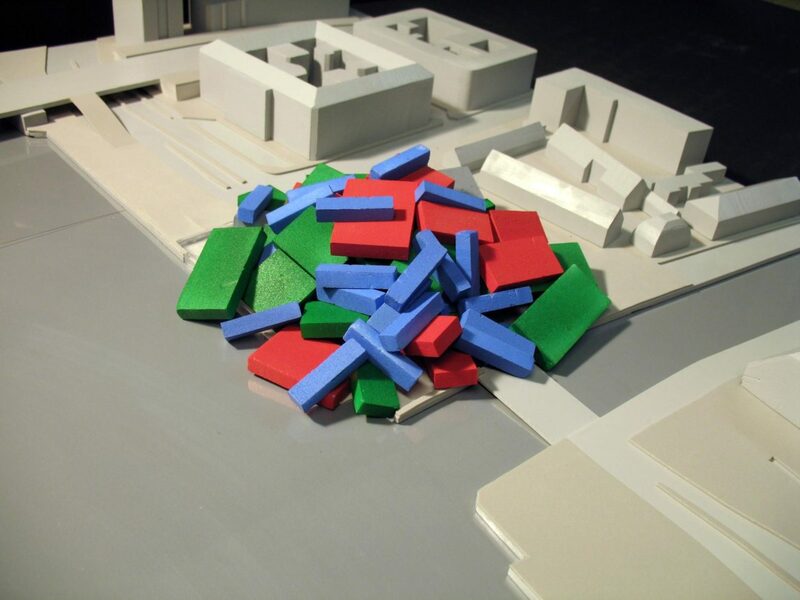 As for BLOX’s interaction with the public and Copenhagen as a whole, the exclusiveness of the building could be countered by unlocking more spaces. The DAC café with its large roof terrace overlooking most of the inner harbour could be a good start. Why not give that experience to as many people as possible? Christine Bjerke is an architect based in Copenhagen. She is co-founder of the urban think tank In-Between Economies and she is currently teaching the Urbanism Societal Change Masters Programme at The Royal Danish Academy of Fine Arts – Schools of Architecture Design and Conservation. She went to BLOX five times.